During the crusade organized by the presidential family in Mwumba commune of Ngozi province from 26 to 31December, the Burundian First Lady shared “revelations” about the way the public affairs should be managed. She also prayed for Burundi. Iwacu gives verbatim transcription of her confession. Lord, you loathe abominations. In Burundi, we have sinned against you. We have committed various sins, we have received many pieces of advice, we have been often informed, but we have not taken them into account as if we had not heard anything. Lord, you have prepared this beautiful day for us so that we should start the New Year being healed, delivered. Our wonderful God we, the powerful and poor, kneel down before you with humility. Lord, we confess to you all our sins. It is a fact that people died in our country, killed by their relatives because of jealousy, rancor and hatred. Heavenly God, the blood was shed because of the settling of accounts. It was this morning that I read a passage that says that the blood shed will be avenged by the shedding of another blood. He who pours out the blood of others will also have his blood shed. I am grateful to you for you have given me this opportunity to deliver this speech for the second time. The blood shed is avenged by the shedding of blood. He who sheds the blood of others will also have his poured. You showed me names of people. I was surprised when I found myself writing these names, again and again. Eternal God, there are many who shed blood. In the name of Jesus, we bow down before you asking for forgiveness. There are those who have stolen. Even today, there are some who are illegally accumulating wealth. In the name of Jesus, there are those who rule by force. There are some who deprive others of their rights. There are many who commit adultery. In the name of Jesus, there are those who work with rancor, jealousy and hate, those who take revenge and they are many. We repent, there is pride in hearts. Heavenly God, we have benefited from your grace, different positions have been entrusted to us. But when we get there, we pretend to be pretentious as if we put ourselves in this position. You witness all this these days, Lord. In the name of Jesus, it grieves you when people think they are strong and powerful. Heavenly God, those who have a lot of riches continue to accumulate more these days. They even seek to appropriate what belongs to the poor. They rob the property of those who do not have much. Heavenly God, we have sinned against you. We, the powerful and weak, prostrate ourselves before you today to ask for forgiveness. We, the servants of God, kneel down to ask for forgiveness for not having done correctly what we were supposed to do, for lying, in the name of Jesus, for having meddled in things that do not concern us. In the name of Jesus, we bow down to you asking for forgiveness. We are here on behalf of other Burundians who are not here, King of kings. Lord, if we repent of our sins, you will forgive us, you will forgive our country and even if there is no rain, it will fall. Lord, if we repent, no doubt, the rain of prosperity will fall in our country Burundi. In the name of Jesus Christ, these minerals, the riches that you have given us, it is really high time they were exploited transparently so that every Burundian should benefit from them, not just some people, some groups, but that all Burundians benefit from them. You have endowed us with rich subsoil. It’s high time its exploitation was done transparently to enrich us all. It is high time, it is high time, it is high time, and perhaps this has always been managed in secret because of our weakness, our sins. Forgive us, Lord, so that our minerals are managed and exploited in transparency, so we all benefit from the profits. 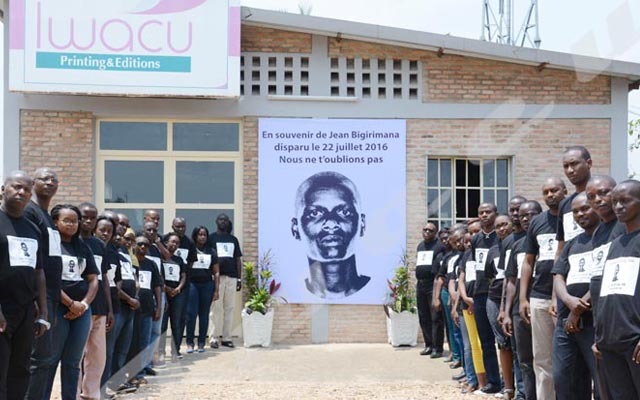 The leader of Amizero y’Abarundi coalition says he is not surprised by the revelations of the First Lady who denounces the crimes committed in Burundi. “This is what we denounce many times and we are often accused of working for colonizers. I do not know what will be said about the First Lady. “Agathon Rwasa says it’s up to the leaders to work on these revelations so that the oppressed Burundians should benefit from country’s wealth. Kefa Nibizi: “A prayer addressed to God and not to politicians “At the level of our party, we have heard this prayer. But we have not understood whether these crimes are committed by state officials or individuals. She did not specify that,” said Kefa Nibizi, chairman of FRODEBU Nyakuri party. This politician says the First Lady said she had a vision but which is spiritual. “In these conditions, we cannot comment on that”. To those who commit crimes, Mr. Nibizi advises them to not do them again to avoid suffering divine punishment. Léonce Ngendakumana believes that it will be necessary that the presidential couple remains in the logic of these revelations if it wants to keep its credibility among people. “This is how Burundi can be saved.” Otherwise, he says, people might interpret these revelations as a manipulation of prayer.